1. Normally to do something in a thorough or careful way: Gary continued to peruse the instruction book as he was setting up his computer for the first time. It may be a losing battle; however, it is worth pointing out that peruse does not mean to look over casually, but to read or to examine carefully. 2. To examine in detail, in order to learn; to look at with attention: The teacher assigned the class to peruse the complex chapter carefully in the biology book. The group of artists perused the paintings in the art exhibit. 4. To read carefully and with close attention, as a demanding or complicated text that requires concentration and effort: Andrew said he would sign the contract after his lawyers completely perused it in great detail, and found out if it was fair and worth paying for. 5. A term that some people consider to be pompous and stilted in business correspondence: Peruse shouldn't be used merely as a fancy substitute for read. Some writers misuse the verb peruse as if it means "to read quickly" or "to scan", like the following example shows: Kevin took off his sunglasses and quickly perused or skimmed through the stack of documents, asked a few questions, and then signed several of them. 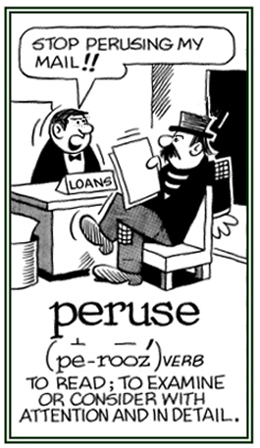 Peruse has meant "to read thoroughly" for a long time; however, now it is often used loosely when people should use the word "read" instead. Sometimes people use it to mean "to glance over, to skim," as in "We only had a minute to quickly peruse the manual, but this kind of usage is still considered an error by many linguistic specialists. 4th edition; Houghton Mifflin Company; Boston, New York; 2006; page 1,312. 6. Etymology: from Middle English per, "completely, throughly" + usen, "to use." © ALL rights are reserved. Relating to or descriptive of reading or examining something very carefully: "The perused report by Robert was sent to the head of the company." A person who reads through something carefully or critically. The reading or studying of something carefully: "Gilbert's lawyer was reading the perusings of the prosecutor and the investigating detective before the trial would start." To examine again or to repeat a reading of something in a very careful way: "Sandra was asked to reperuse the report for any possible errors." "The editor of the lexicon insisted that his staff reperuse the word entries that they were working on before they submitted them for final inclusions in the dictionary." A regulated entity that owns and maintains wires used to transmit wholesale power.